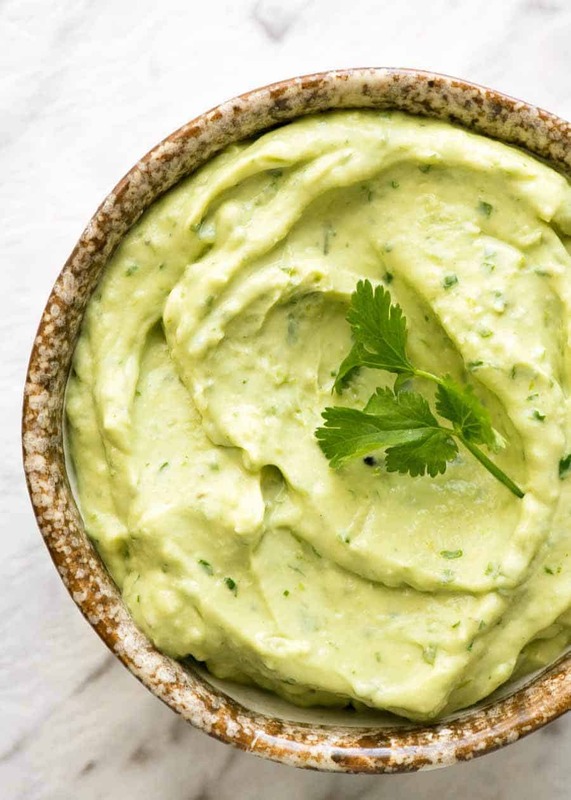 A quick, fresh Avocado Sauce for dipping, dolloping and scooping! 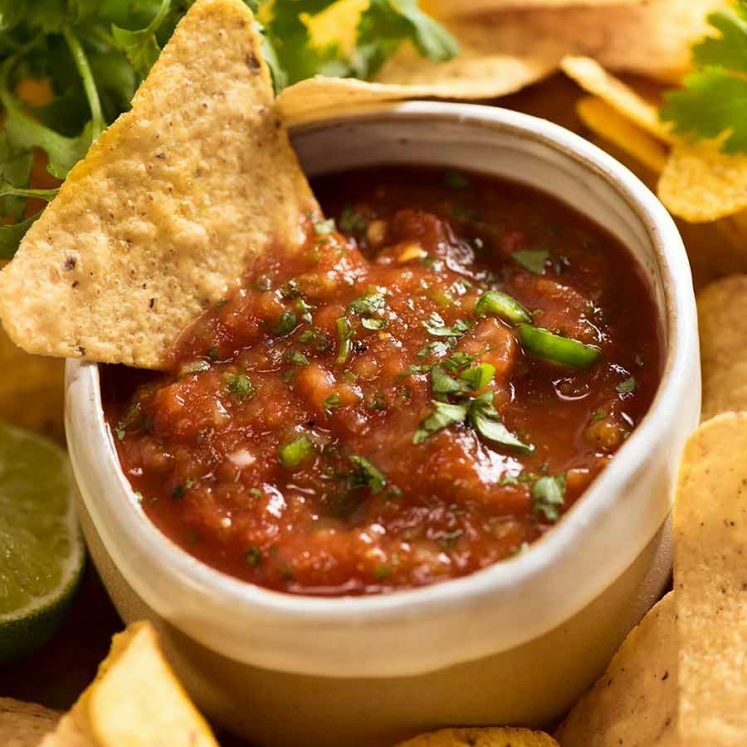 Terrific as a dip for chips or vegetable sticks, as a sauce for all things Mexican including quesadillas, burritos, nachos, and tacos. This is a terrific Avocado Sauce that I use for all things Mexican. Pictured above with Quesadillas, the other recipe I published today. 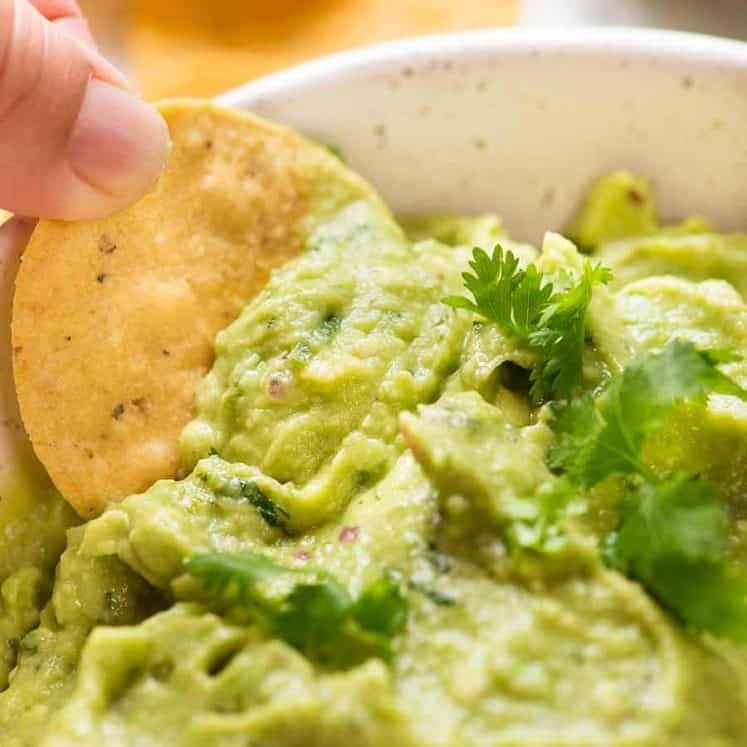 It pairs really well with Mexican food because it’s got a lovely bright flavour which tempers the bold flavours of Mexican food – and of course is reminiscent of our ever favourite Guacamole! 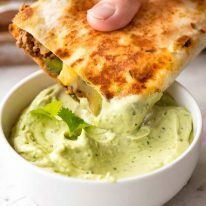 Made with avocado, sour cream or yoghurt, lemon or lime, coriander/cilantro, garlic and olive oil, I describe it as fresh and bright but it’s also got the natural rich creaminess from avocados. 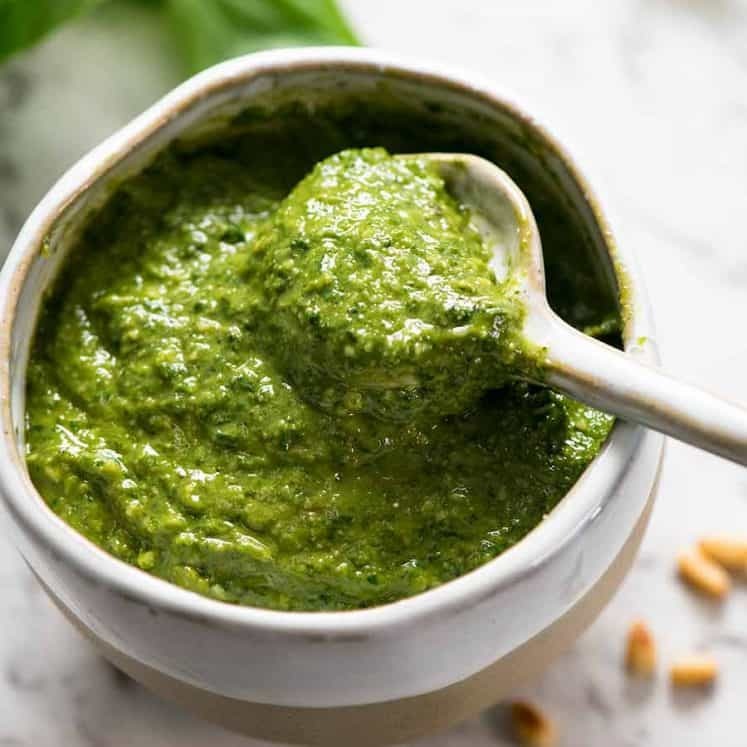 Quick and easy to make with the aide of your food processor, the other benefit of this Avocado Sauce is that it stays green for days and days! Pictured below on Day 3, and it’s just as green and fresh tasting as it was on Day 1. More ways to get your avocado fix! 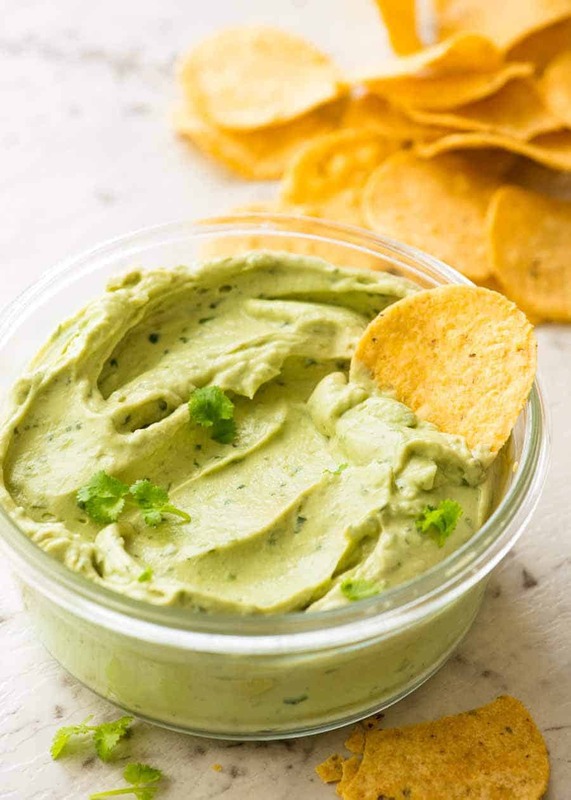 Guacamole – the king of all Avocado dips! An Avocado Sauce is a far healthier option than a mayo-laden dip! 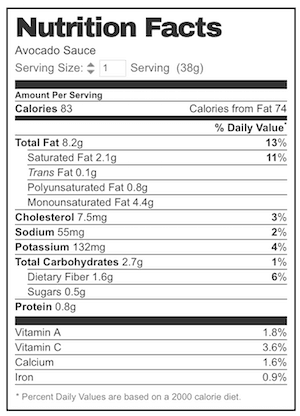 Avocado are packed full of vitamins, minerals, fiber and healthy fats! One of the few natural produce that contains a substantial amount of monounsaturated fatty acids which are good fats known to lower cholesterol and promote heart health. 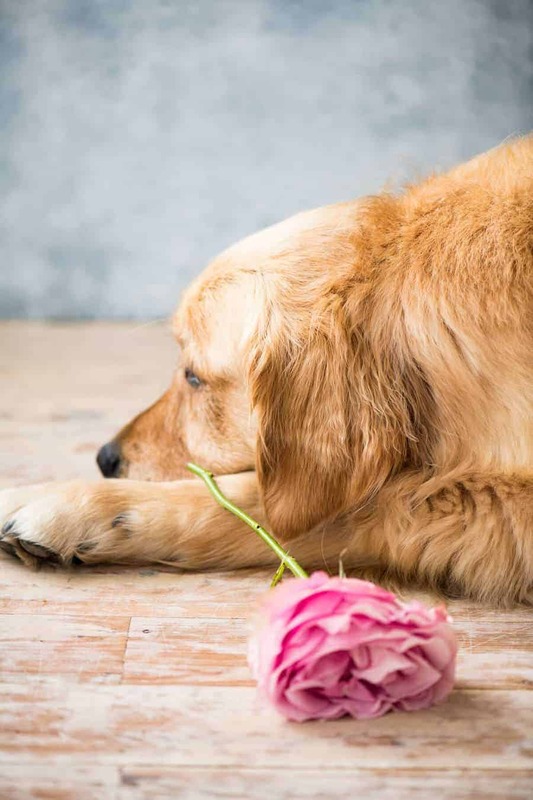 That time I tried to teach Dozer to hold a flower in mouth just because it would be so cute….. Totally yum! This was very quick and easy to whip up – I probably used closer to a whole lemon as I like serious zing. Looking forward to having this with your quesadillas tonight! You use oil in recipe, but doesn’t show in video. Is it supposed to be used in recipe? QUESTION … IS THERE ANOTHER HERB THAT CAN BE SUCESSFULLY USED INSTEAD OF CILANTRO/CORIANDER ? I REALIZE THEY ARE THE “GO TO” SEASONING IN MEXICAN CUISINE BUT I CANNOT WORK UP A LIKING ! AND FOR SUBSTITUTES, I ALSO DO NOT LIKE PARSLEY, AS I ALWAYS FIND IT BITTER. 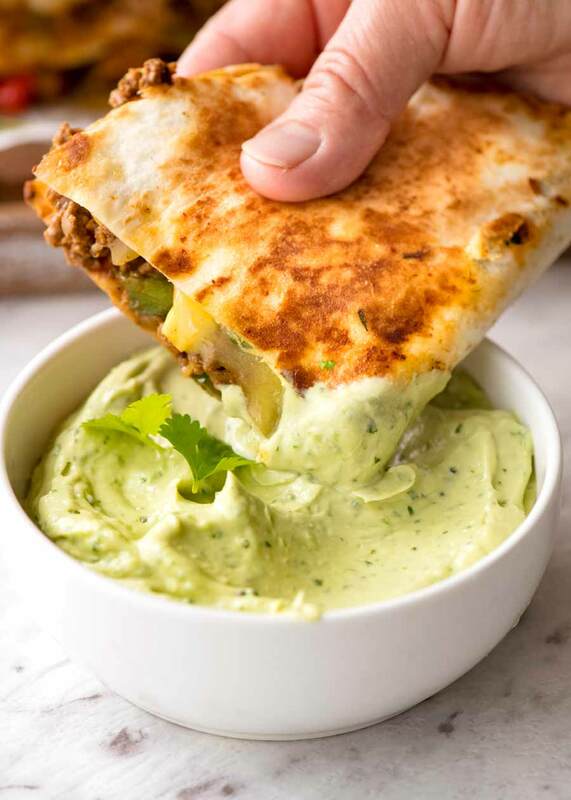 LOVE THE IDEA OF FREEZING THE QUESADILLAS. NO SOGGINESS WHEN THAWED ??? I HAVE FROZEN FILLINGS BEFORE BIT NEVER THE “MADE” RENDITION. THANKS !!! LOOKING FORWARD TO THE EATING/ENJOYING & THE LITTLE SURGE OF TIME SAVING WITH THE PREP ALREADY BEING COMPLETED. YOU HAVE GREAT IDEAS !